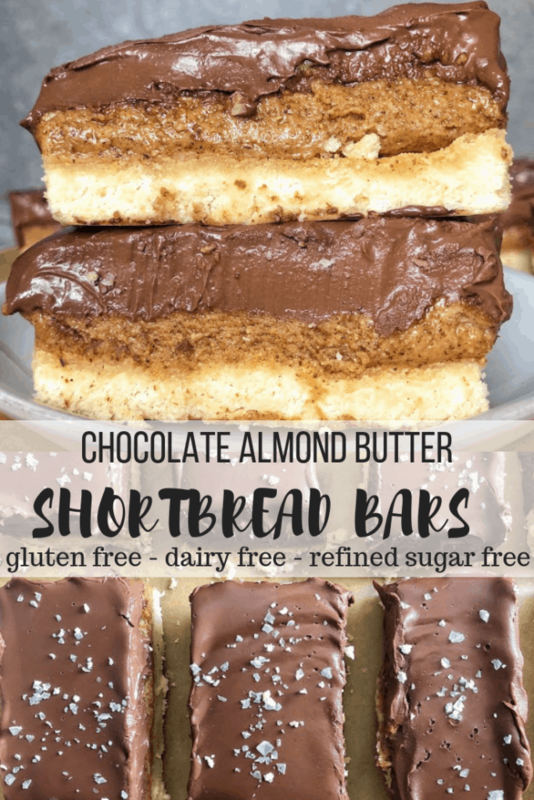 These paleo Chocolate Almond Butter Shortbread Bars are a rich, decadent healthy treat that are gluten-free and dairy-free! You won’t believe they are healthy! I did something bad…but it feels so good. Yes, I cannot stop singing Taylor Swift whenever I see these chocolate almond butter shortbread bars because they are so bad, in the best way possible. I originally was playing around in the kitchen when it came to me that I really wanted to make some sort of healthy dessert that no one would have any idea was actually healthy. It was going to have to have chocolate and nut butter in it, of course, because that is how to make something perfect in my eyes. So that’s what I made. 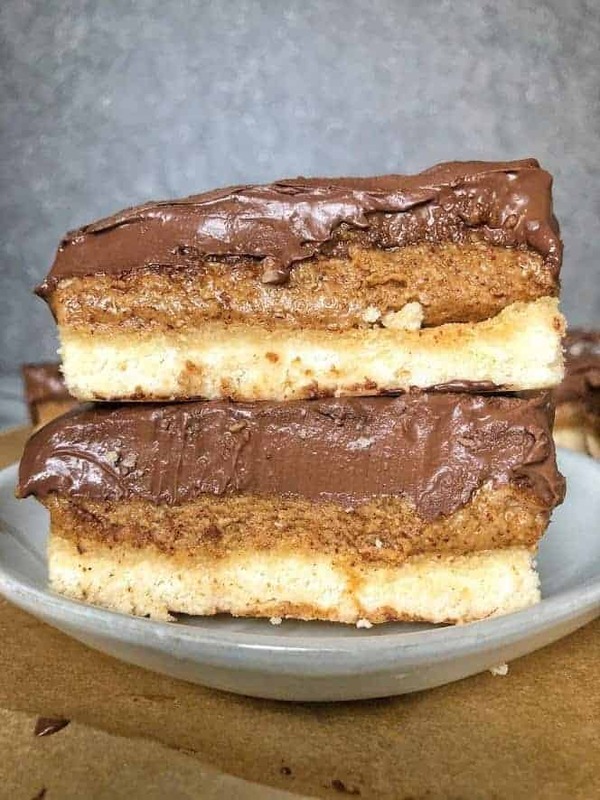 Think the richest chocolate ganache, followed by a layer of the creamy nut butter, and then a shortbread crust. In my eyes, that is my version of heaven because it included chocolate, nut butter, and cookies. How does it get better than that? Oh wait…it does. All of the ingredients are real and this dessert is almost completely plant-based, yet I promise you that you wouldn’t even know. 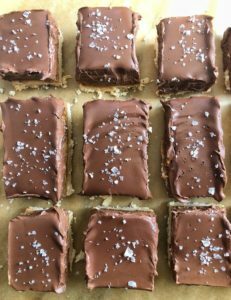 Preparing these chocolate almond butter shortbread bars is also another easy way to impress your guests, because they seriously look liked you slaved over them, but they are really actually easy. Feel free to change up the nut butter layer in the middle to any type of butter you would like. If you aren’t strictly paleo, I bet peanut butter would be mighty tasty here. I am so excited for you to try these bars, you’re going to absolutely love them! 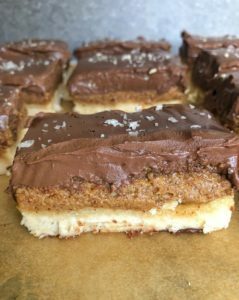 Paleo Chocolate Almond Butter Shortbread Bars are a rich and decadent healthy treat, yet completely gluten-free and dairy-free! In a bowl, mix together all shortbread ingredients. 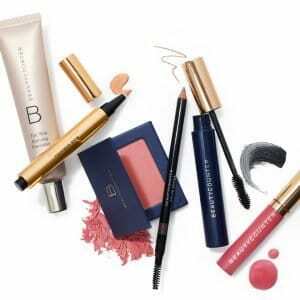 Pour into 8×8 pan and flatten. Pierce with fork several times along the top so air can escape. Bake for 10-12 minutes (until starting to turn golden brown). Let cool completely (I made my crust the day before). In a separate bowl, mix almond butter, maple syrup, coconut flour, coconut oil, and salt. Pour the almond butter mixture over the crust and place in fridge for 30 minutes. While the crust and almond butter is chilling, pour chocolate chips in heat proof bowl. Heat can of coconut milk on stove over medium heat. Once milk starts to boil, pour over chocolate chips and stir continuously until completely melted. Pour chocolate coconut mixture over almond butter mixture and allow to cool in fridge for at least an hour. 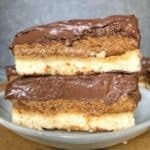 Incredibly decadent and super easy to make! My mom found this recipe on Instagram and it’s perfect because she’s gluten free and I’m vegan. Thank you thank you! These are SO GOOD. I couldn’t stop eating them so I (reluctantly) had to freeze some…but only after I ate like half the pan. They are the perfect blend of salty & sweet and come along with a nice cookie base to balance it out. The only thing I will say is that it took a quite a long time for my chocolate to finally harden enough to cut and stay put on the bars. In my opinion, these are best a day or two after you make them. Definitely making again! Thanks for the recipe!